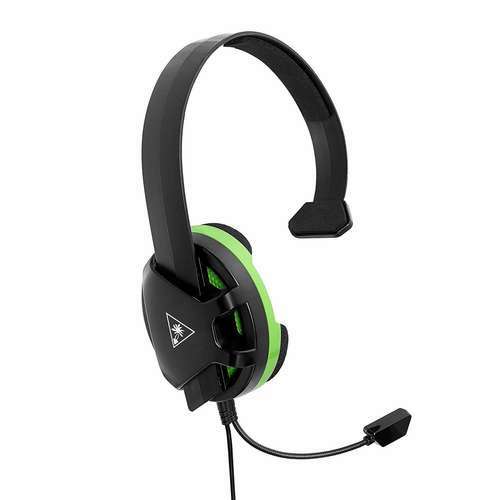 This unique headset is designed for talking to friends over a PlayStation 4, Xbox Live and mobile devices that have a 3.5mm jack connection. The headset also works well with your existing home theater system and makes an attractive solution for people using TV audio. Weighing only 120g, the headset makes an excellent device for long gaming sessions. With its in-line remote control system, you can adjust the volume to a comfortable level for the extended sessions. Here’s a brief review of the headset. Turtle Beach Wired Recon Chat Headset features a unique open ear-cup design. This allows gamers to listen to audio from a home theatre system while chatting with other players. It comes in two pieces- the earcup and the headband and both are made of hard plastic material. The headband is shaped in the form of a ‘p’ . One end takes on a slanting design while the other end has the shape of a six-sided polygon. Turtle Beach log is etched on the exterior of this end and the interior features an ear cushion, which alleviates noise. The headband slides back quickly into the dark outer shell. Once inserted, it locks into place to allow users to adjust the earcup up and down for a comfortable fit. Turtle Beach Wired Recon Chat Headset has a special feature that will enable gamers who use glasses to play in comfort. This specsfit glasses avoidance zone has a unique channel in the ear cushion that rids of pressure on the glasses when using the headset. Also, the centre of the ear cup is fitted with a high-quality 40 mm speaker for crystal clear audio. This beach recon chat headset has an over-the-ear design. This allows gamers to wear it on the right or left ear; whichever side feels comfortable.